$5.00 Gas? Are they serious? With the current average national price for regular gas now being $3.86 a gallon, it seems like every “expert” yakkity yak on the planet is screaming, “FIVE DOLLAR GAS! FIVE DOLLAR GAS!”, and they are saying it as though there is absolutely no doubt we are going to see this 30 PERCENT (??!!) INCREASE IN GAS PRICES IN THE NEXT FEW MONTHS. HOW MANY TIMES DO YOU NEED TO SEE THIS SORT OF THING TO UNDERSTAND YOU SHOULD BE LOOKING IN THE OPPOSITE DIRECTION? Do you honestly believe that ALL of those people who are chanting “5 Bucks!” in unison really have a clue as to where prices are heading? Have they done tremendous volumes of holy grail type research? Are they experienced, even sometimes right, professional traders…? Or are they virtually ALL just a bunch of want-to-be-noticed media guys who are simply mouthing the same blather they have heard from a hundred other people before them? NOT TRUE…Yes, there are some years when prices have had a tendency to trend higher as we start the year and head towards summer, but there are also MANY years when this so convincing bullish “story” is nothing but a sucker play. To substantiate this, check out the stats on the following table in which you will see: In the 11 years since 2000, in 10 of those years there have been relatively large percentage sell offs in Unleaded Gas prices that began on various dates between February and May. The smallest break was 10% in 2007. 9 of the 10 years had declines of 15% or greater. 5 of the 10 were more than 20%. The total trading days to complete the moves…roughly 10-20 days…is an indication as to how STRAIGHT DOWN this market tends to move. From the current approximate $3.30 level, a 15% decline would mean a 50 cent per gallon selloff…or $21,000 per futures contract. In the one year in which there were no significant declines in the 1st half of the year, in the second half of 2008, Unleaded Gasoline collapsed 70% concurrent with the beginning of The Great Recession. Many of the sell offs “came out of nowhere”…They often just went from new highs one day to quietly beginning a down move the next...where one innocuous down day was followed by another, and another, and another…and so on. There was rarely (if ever) some signature event that would tell you, “Sell now!”…The truth is, there never is. I BELIEVE TODAY’S MARKETS ARE THE MOST VOLATILE I HAVE EVER SEEN. WITH THIS IN MIND, A 25-30% DOWNSWING WOULD NOT SURPRISE ME AT ALL. IN OTHER WORDS, I SEE THE VERY DISTINCT POSSIBILITY OF AN 80 CENT TO $1.00 SELL OFF IN UNLEADED WITHIN THE NEXT 3-4 MONTHS. Yes, those are big numbers but such IS the nature of this game. Futures is not a game of minor increments. 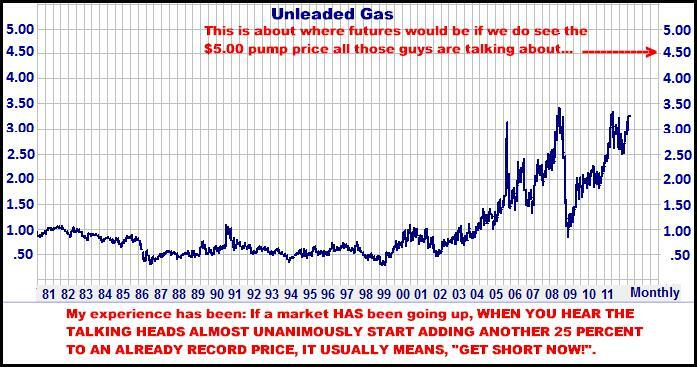 I should clarify this is not a case in which I am saying you should get short and stay short for 6-9 months…Unleaded IS volatile and can easily trade sharply lower, then come right back up again. My point is, if the past is any guide at all, in the overwhelming majority of years, there WILL be a high percentage sell off in this market anytime between now and the end of June…but to catch it, YOU HAVE TO GET SHORT NOW AND STAY SHORT. 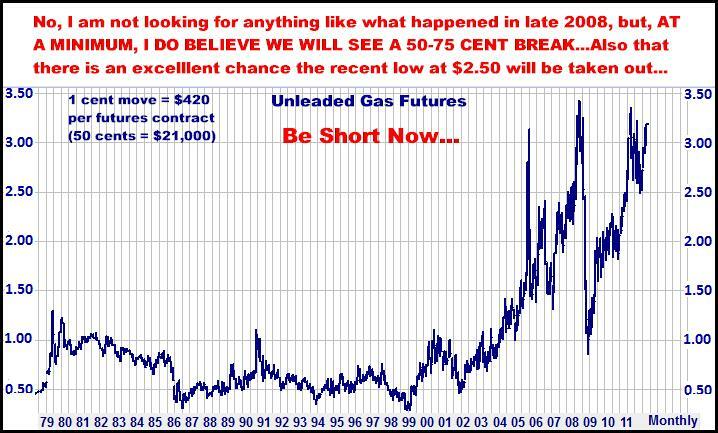 Just for perspective here is an expanded chart to show what $5.00 Gas would look like relative to the past 30 years…Sure, anything is possible in the markets, but I firmly believe the bet here is overwhelmingly to the down side…And I think it starts any day now…literally. 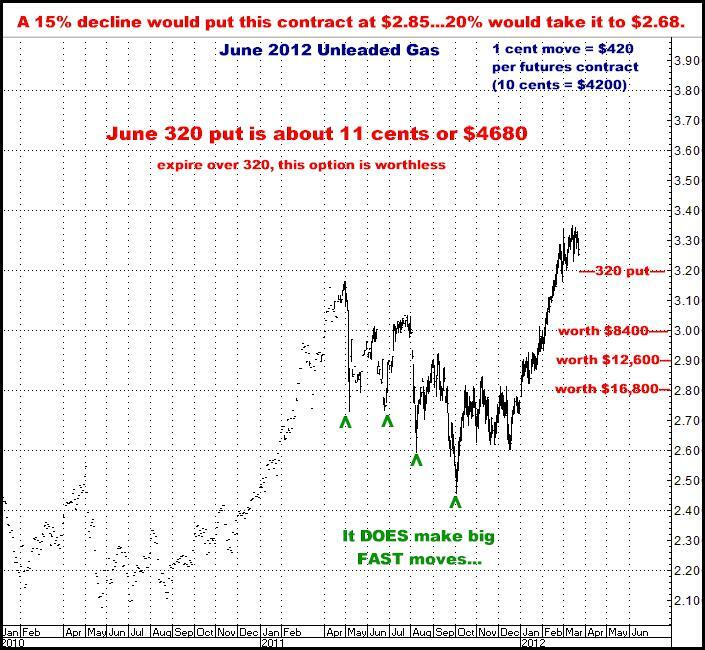 Here are several approaches….I would also note, so far in 2012, there has not yet been even the slightest sell off…YET? 1. Do not quit on the trade if it is not working. 2. Stay on the trade when it does start working. Here is how it looks in the May contract. As I write this the markets are still open and may have changed by the time you are reading it. 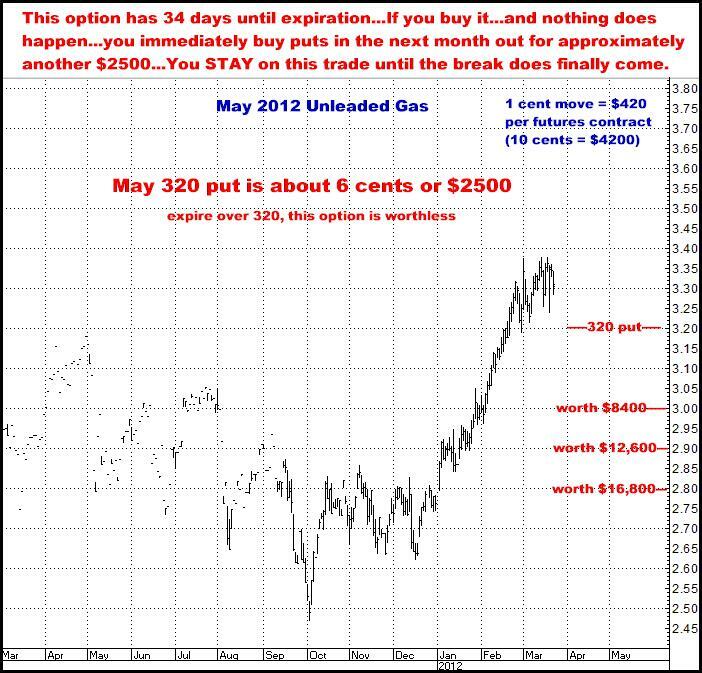 One more time…If you do position in the May, you put something on and MAKE SURE YOU KEEP SOMETHING ON IF IT DOESN’T HAPPEN YET…One potential benefit to this approach is, if the market does rally, your next set of put options can be closer to where the market has subsequently moved…Like, for example, having the market at 360 for and then be buying the 350 puts.. In a sense, the “easy’ part is spending the money the first time, and then being able (psychologically) to do it again if it doesn’t work…The hardest part WILL be sitting on it when and if it does start working. Give me a call if you want to take a closer look…There really are a number of ways to do this….